Pushing through FEAR, are you strong enough? Do you have the commitment to see your vision all the way through? Many do not know how to overcome or have the strength to push through some of the greatest fears. Fear most of the time is created by what we put within our minds. My old head coach of the Buffalo Bills Mr. Mike Mularkey has a saying "The greatest fear we have to overcome, is the fear we put into our minds! "Entrepreneurs and Leaders are known for being risk takers and overcoming their fears. We create a vision of knowing we could fail and fail fast. When we do fail, it does not keep us down it makes us want to get up and try again in full force. There is no fear of failure with leaders and Entrepreneurs. Failure means we try something, and it did not go as planned, and we learned from it, learning how not to repeat the same mistake continually. Do you have a fear of success because of the number of lives you could change, or because you have that power inside of you? So, what if you are successful, what if you do accomplish your vision? The world, your workplace, and your family might be a better off. There are other's out there who are doing what they are passionate about doing while supporting themselves and making a positive impact on others. The concern is something you should use to empower you and not shame yourself. 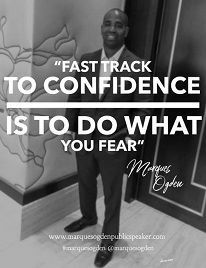 Fear should never paralyze the actions you need to take; instead, you need to use it as fuel to propel your actions towards accomplishing your vision. The moment you push through fear and experience success is one of the greatest feelings you will experience in life. This will be the driving force for you to want to create more life successes. When you accomplish life successes, it puts you in a much better state, to live a long, happy, fulfilling life. 3. Set daily goals that you can track and achieve to build confidence in yourself. I challenge you to put yourself in a spot where you feared achieving success the most and pushed through it to achieve your goals and vision. Now that you identified that moment of fear you overcame share the experience to help others overcome their fears.